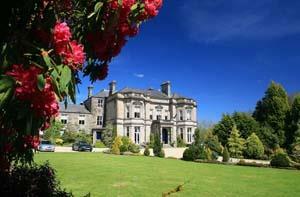 Tre-Ysgawen Hall Hotel & Spa Country House HotelSet in acres of secluded landscaped gardens and woodland a short drive inland from the breathtaking east coast of Anglesey. Luxuriously appointed with 29 bedrooms, 5 of which are four poster suites 1 with a whirlpool Spa Bath. Spa Breaks are available throughout the year. The Spa `Experience` Break includes Welsh Breakfast, table d'hote Dinner and full use of Tre-Ysgawen Spa while Spa 'Indulgence' in addition to the above also includes Pamper Day Lunch in the Wine Bar and a 1 hour Spa Treatment. Spa Breaks are available throughout the year. The Spa incorporates a 16m level-deck Swimming Pool, Sauna, Salt Inhalation Room, Experience shower, Whirlpool and air-conditioned Gymnasium. The Beauty/Therapy Suite offers a comprehensive range of Spa Treatments. Adjacent to the Spa is the Clock Tower Cafe Wine Bar which is open from 9.00a.m for light snacks with the evening menu being available from 5.30p.m. A sought after venue for Conferences, Meetings, Weddings & Civil Ceremonies. Set in acres of secluded landscaped gardens and woodland a short drive inland from the breathtaking east coast of Anglesey. Luxuriously appointed with 29 bedrooms, 5 of which are four poster suites 1 with a whirlpool Spa Bath. Tre-Ysgawen Spa incorporates a 16m level-deck Swimming Pool, Sauna, Steam Room, Whirlpool and air-conditioned Gymnasium. The Beauty/Therapy Suite offers a comprehensive range of Spa Treatments. Adjacent to the Spa is the Clock Tower Cafe Wine Bar. Children welcome from any age.